Wondering how to cook artichokes? This no-fail method keeps the meat tender and moist while also infusing the artichoke with fragrant lemon and garlic. Serve with a simple lemon garlic butter dipping sauce or aioli for a delicious appetizer or main course. 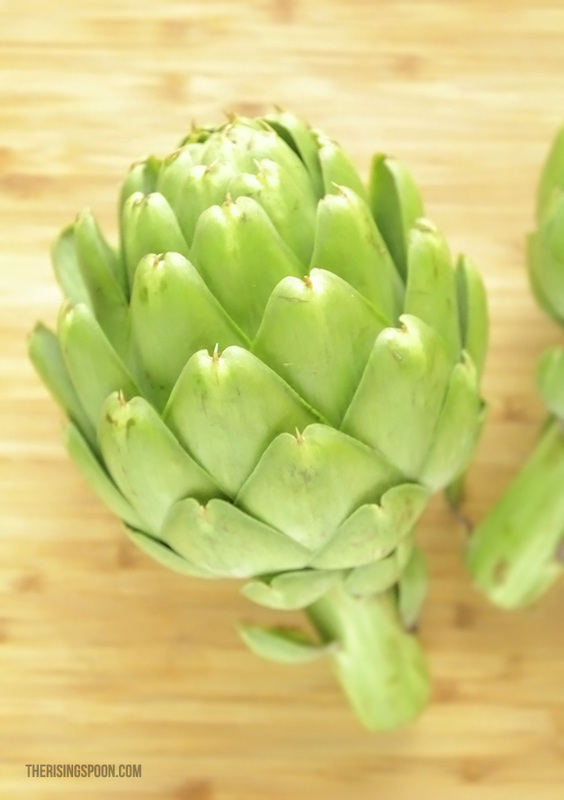 Can you remember the first time you ate a freshly cooked whole artichoke? Most people can! 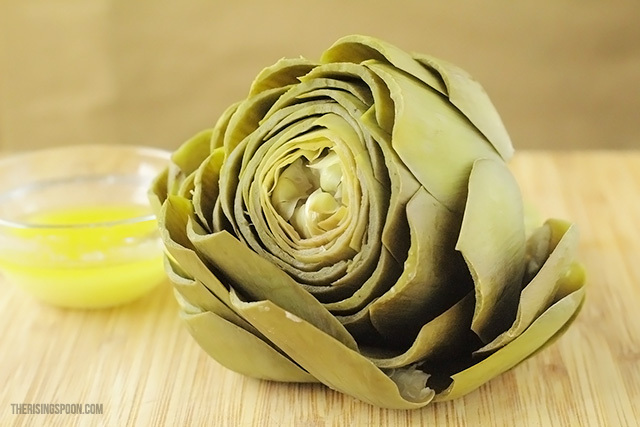 It's an unforgettable experience, probably due to the artichoke's unique appearance and the method used to eat it. How could you forget plucking off the leaves piece by piece, dipping them in butter or mayonnaise, then scraping off the tender meat between your teeth? I was introduced to artichokes at age 12 or 13 while visiting a friend. We skipped into the kitchen one spring afternoon for a snack and found her mom boiling artichokes. After exclaiming that we were hungry, she sat us down and plopped a plate of artichoke leaves in front of us, followed by a few small bowls of melted butter. I was completely mystified until I watched both of them go at it. When I tried the leaves myself, I loved the artichoke! However, the whole process still seemed weird. I thought, why go through all that trouble for a little bit of food? That's a valid question coming from a middle schooler, but I knew little to nothing about food and cooking back then, so couldn't appreciate the effort. It took over a decade for me to eat whole artichokes again. When I finally got around to fixing them as an adult, I followed the same method I had seen as a youngster: boiling. As a beginner cook, it made sense. All you need is water, the artichokes, some salt, and whatever you want for a dipping sauce (lemon juice & butter in my case). No fancy ingredients to stuff the veggie, no burning it on the grill or in the oven. Just a gentle boil. This really is my favorite technique for cooking an artichoke. But, I was missing a major component for making the artichoke taste better. Like, a dead simple addition. I don't know how I skipped this for so many years. I wasn't seasoning the water! Big mistake. This makes such a HUGE difference. Sure, if you don't flavor the water your artichoke leaves will still taste great, but you'll find yourself relying more on the dipping sauce. There's nothing inherently wrong with that, but if you take a wee bit of effort to flavor your boiling water, it'll infuse the leaves with lemon and garlic so you won't actually need a dipping sauce. But let's be real...you'll still use it! Who the heck passes up dunking their food in melted butter? But What If You've Never Cooked Artichokes At Home? Unless you've lived with a person with an affinity for the cooking, dipping, and scraping process (much beloved by artichoke fans), there's a good chance your only contact with this vegetable has been marinated artichoke hearts in a jar or can. Nothing wrong with that. I keep artichoke hearts around for adding to pasta, spinach and artichoke dip, and pizza, or to eat straight from the container! 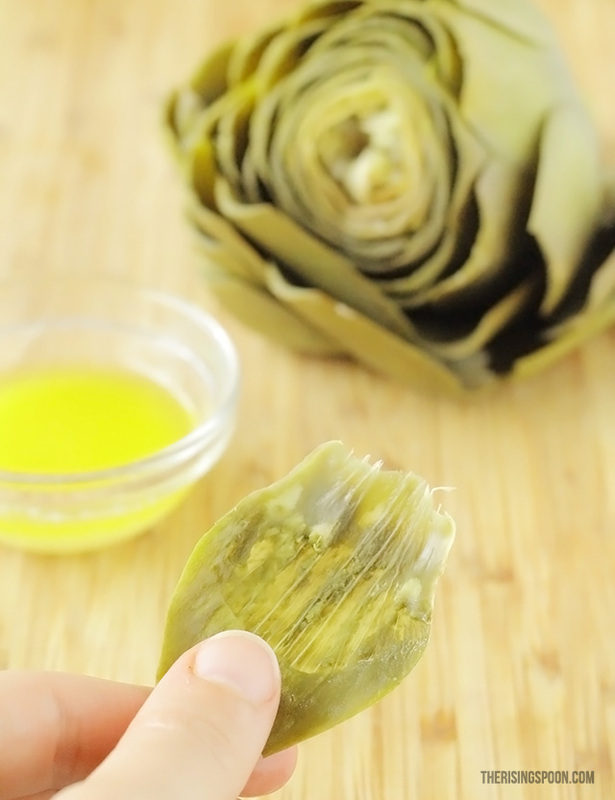 They're tangy and delicious, but nothing in comparison to fresh artichoke meat and hearts. If you're unfamiliar with these unique springtime vegetables, have no fear! Their spiky exteriors (watch your fingers) make artichokes seem intimidating, but they really aren't. All you need is a pair of kitchen shears (or sharp scissors) to snip off the thorny tips of the leaves and a sharp knife to cut off the top inch or so, and you're all set for prepping. Some folks like to peel the stem so it's easy to eat the core later, but that's totally optional. 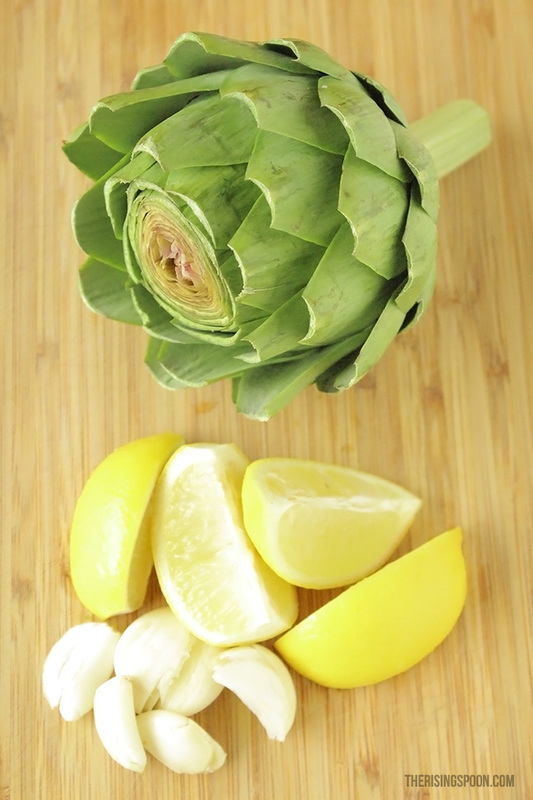 For a step-by-step tutorial (with pictures) on preparing, cooking & eating an artichoke (if you've never made or eaten one before) check out this post from Simply Recipes. You can also watch my video below. If you're a visual learner, make sure to watch my short recipe video by clicking below. 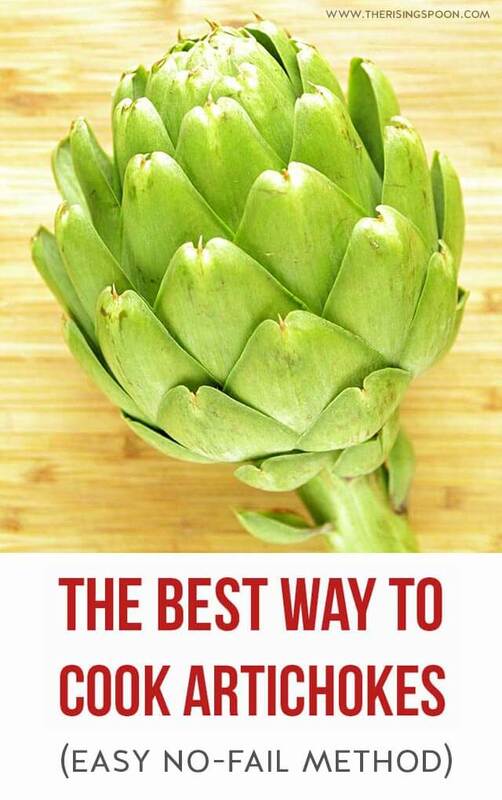 It illustrates the easy process of prepping and cooking artichokes! Wondering how to cook artichokes? This no-fail method keeps the meat tender and moist while also infusing the artichoke with fragrant lemon and garlic. Serve them with a simple lemon butter or aioli dipping sauce for a delicious appetizer or main course. Now go to the stem and remove any small, woody leaves around the base. You can either cut off the stem or leave it intact. Totally up to you. Some folks will peel the stem and leave it on so they can eat the core (the little bit inside the stem). I found that the stem tasted just like the heart, but others have said it tastes bitter. Slice the lemons in half, then peel and smash the garlic cloves. When the water has come to a gentle boil, salt it to taste, then throw in the garlic cloves. Squeeze the juice from the halved lemons into the water, then throw in the peels. 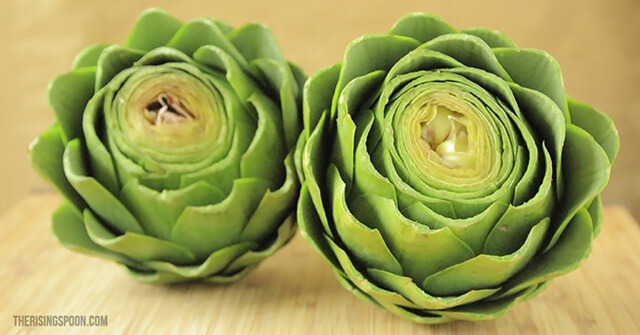 Add the artichokes to water, cover with a lid, and reduce the heat to medium-low or low. Cook until the base is tender enough for you to easily pierce it with a knife, or you can easily remove a leaf from the base (with hardly any resistance). Artichokes generally take 45-60 minutes to cook, but it's all dependent on their size. 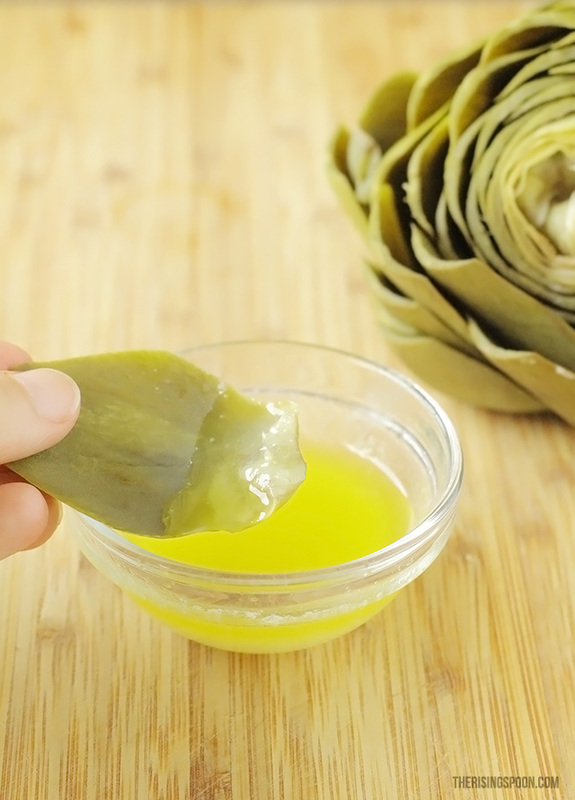 Tiny artichokes might be done in 30-40 minutes while extra-large artichokes could take 75 minutes. Mine took about an hour til they were super tender, with the leaves almost falling off. About 10-15 minutes before you're ready to eat, zest and juice the lemon, mince the garlic and add the butter to a small saucepan. Melt over medium heat. Once it starts bubbling, cook the butter, stirring constantly, about 2-3 minutes. Add the garlic and cook 30-60 seconds or until fragrant. Remove the sauce from heat and stir in the lemon zest + juice. Set aside to let the flavors develop until the artichokes are ready. If the sauce solidifies before eating, reheat on low for 1-2 minutes until melted again. Note: If you're serving this to more folks, you can either add extra butter to stretch it further or double/triple the sauce. Isn't it delicious? Discard the leaf (make a pile on your plate), and repeat until all the leaves are gone. When you reach the inner "heart", remove and discard the fuzzy part (called the "choke"), and scoop away the actual artichoke heart, which is a hunk of artichoke meat. Dunk that in the remaining sauce and enjoy. It's the best part! When looking for fresh artichokes at your local market, choose ones with tight, bright leaves that are a good weight for their size. For EXTRA flavor, add 1-2 bay leaves to the boiling water. I totally forgot to do this! I'll have to try it next time. I'm also thinking that substituting homemade beef, chicken, or veggie broth would make the artichokes taste even better!